Wow, it’s been a long time waiting for the return of Ananke. Lots of emails, Facebook messages, tweets and general hollers from all of you asking me when it will be back. Well… it’s back. A blend of Ananke batches from 2015 and 2016 paired with a healthy dose of raspberry puree. 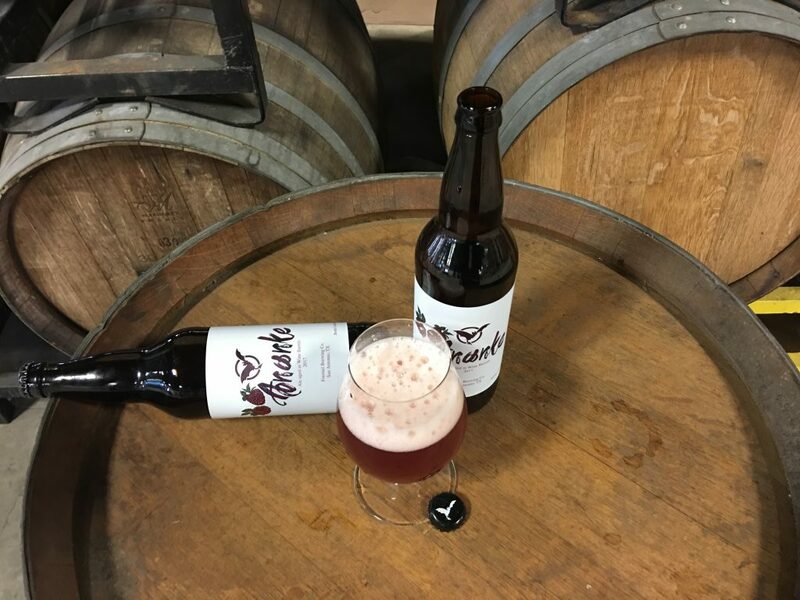 Both batches were primary fermented in stainless steel with a Westmalle yeast strain, then aged in Pinot Noir barrels with Jason Davis’ signature blend of yeast and bacteria. 210 pounds of raspberry puree was added to net approximately 9 bbls (1 bbl = 31 gal) of finished product, our largest volume of Ananke to date. The result is what we’ve come to expect from this beer: a delicate, round sourness with medium acidity and a pronounced but not overly-sweet raspberry flavor. This batch was a blend of 122 gallons of Ananke from June 23rd, 2015 and 366 gallons of Ananke from May 5th, 2016. All 210 pounds of raspberry puree were added and left to age for 24 days in stainless steel before being bottled on November 13, 2017. Bottle conditioned with INIS-913, a brett strain isolated from a famous American wild ale brewery. Under pressure, INIS-913 lowered the pH, increased the total acidity, and intensified fruity esters. Leaving this Ananke with a distinct effervesce that is unique to her predecessors. Some stats, for you stat nerds… ABV: 6.86% OG: 14.2P FG: 1.6P; pH: 3.75 IBU: Doesn’t matter, why would you even ask? We’ve come a long way with our bottle release format, but for this one, we are going old school. There will be 1,000 bottles available for sale on Saturday, February 10. We will open the doors to the brewery at 8am for a bottle share and an 9:30am release. As you enter, you will be given a numbered wristband and you will be called up in order to purchase your bottles at 9:30am. Per old school Freetail rules, there will be no pre-announced bottle limits. We will determine the bottle limit based on the number of wristbands handed out at 9:15am. We will guarantee a minimum limit of 3 bottles/person, price will be $14 per 22oz bottle + tax.